This set is so cute it almost hurts! A simply darling accessory set for your favorite bebé. (John took one look at this photo and promptly named it "Claude.") 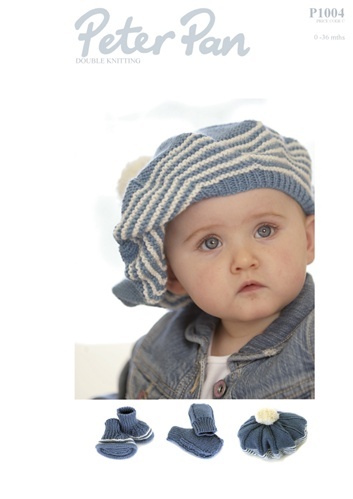 Peter Pan DK is the quality super-soft acrylic yarn perfect for children's clothing. Four sizes to fit 0-6months (6-12 mos, 1-2 years, 2-3 years). For all three pieces, use 1(2, 2, 2) balls of a Main Color and 1 50g ball Contrast Color of Peter Pan DK.